Platinum-selling, Grammy-nominated musician B.o.B. spent Sunday tweeting about how NASA has spent its entire existence tricking the world into believing that earth is round when, in fact, it is flat. The government conspiracy, he asserted by way of several very intense .jpgs, dates back to the Freemasons (including early astronomers such as Galileo) and we all know what “the Freemasons” means: Illuminati. This conspiracy, B.o.B. asserts, has effectively pulled the wool over our eyes for generations, and also is not that far off from the first-episode debut of Sunday night’s X-Files reboot, down to the quality of the .jpgs. The X-Files has not aired on FOX since 2002 and yet was still pre-empted by a bunch of sports anchors yammering about some kind of football game in which Cam Newton played; Newton was nowhere to be found during the pre-empting, therefore the whole 21 minutes felt like an elaborate troll worthy of high school jocks using their brute physicality to torture the nerds and their acute intellect. It worked: the unanticipated delay just heightened the anticipation for the episode, which in turn made its spectacular badness even more painful. That is, if you took it seriously; the plot set-up and episode’s desperation to be relevant and make so many big statements about the political tenor of 2016 was actually high camp, if you thought of it as such. And were it coming from anyone but Chris Carter, we could have assumed camp was its philosophical end-game; at its funniest point, Scully uses a search engine called FINDER SPYDER, and the whole system unraveled. 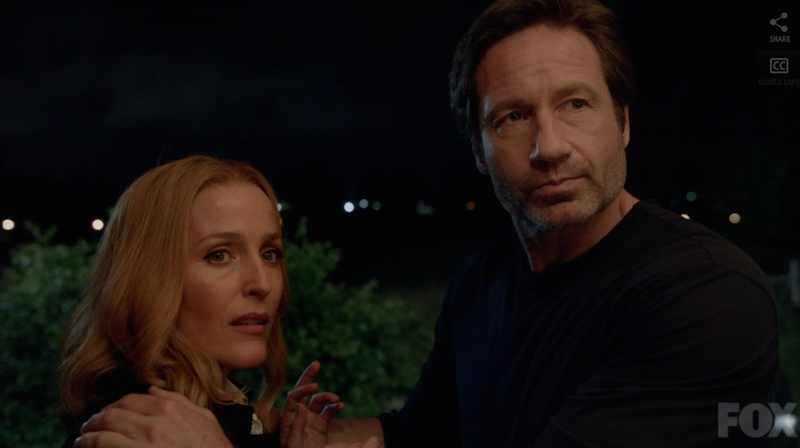 The frantic, rather convoluted plot: the X-Files are long-shuttered, and Scully and Mulder have essentially ended their personal and professional relationship—until Assistant Director Skinner calls Scully at her job helping children born with anotia (unformed external ear), looking for a reclusive Mulder to go investigate a new thing that is NOT an X-File, but is X-Files-adjacent. That thing is a right-wing conservative nutcracker named Tad O’Malley (also funny!) who claims to have evidence that aliens were drawn to earth after the H-Bomb to try to save us from ourselves, and that the crash in Roswell was one occasion during which our evil government was able to harness the advanced technology of said aliens. Mulder meets and immediately takes to O’Malley, particularly after he introduces him to a secret compound housing a man-made replica of an alien vehicle shaped like a liquid silver paper airplane. And once O’Malley introduces Mulder to Sveta, a woman who says she’s been abducted—and impregnated—numerous times, Mulder is totally convinced, probably because he’s spent too much time inside the MindQuad. “I don’t know what you mean!” stage-whispers Scully, and again it feels implausible that the writers didn’t purposely inject this wildness with a bit of absurdity, because we certainly don’t either. Even a bit. At best, that line was a self-aware acknowledgement that The X-Files has never been keen on clarity, if we’re being honest, and it petered out as must-see television somewhere around 1997 or so, during its fifth season (and I’m being quite generous). What happens after this painfully plotted epigraph to a coda that didn’t necessarily need to be written? In an ideal world, The X-Files—now open again at the behest of a very busted-looking Cigarette Smoking Man—will take this opportunity to revert to the monster-of-the-week rubric that defined its first, and best seasons. But we’ve already delved too deep into this conspiracy to reasonably emerge unscathed by the incoherent rantings of lone wolf Mulder—and after a test that may have revealed some errant DNA in Sveta’s blood, something mysterious which also mirrors that of Scully’s—this train’s too full-throttle to jump off now. If it pains you to watch, perhaps you can find another show you like in the Finder Spyder.